If you have never played a MOBA (multiplayer online battle arena) then you are in for a treat when Arena of Valor comes to the Nintendo Switch later this year (we hope). 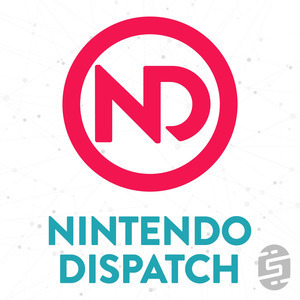 Before this announcement that developer and publisher Tencent Games was bringing the game to Nintendo Switch we had never really hard of it even though we probably should have. It has been available for iOS and Android for almost 3 years in China and about 8 months in the US and has over 80 million daily active players and 200 million monthly active players. In addition to these impressive numbers of players that make it the most downloaded app globally, it is also the world's highest grossing game (source: Wikipedia). For about a week Tencent gave Switch gamers a chance to be part of a closed beta and both of us were part of it and wanted to give a full hands-on impression. The gameplay at a high level is relatively straight foward. You pick a hero of your liking from a group of about 40+ all with different classes and abilities ranging from marksmen, warriors, to mages. You then depart on a 5v5, 3v3, or 1v1 mission to destroy the other teams base by working your way through the map destroying defense towers and battling with other heroes attempting to get to their "core" and destroy it. The gotcha here is that the defense towers are able to shoot your team's heroes directly unless they are being distracted by minions that are automatically deployed and are sent on a death march toward the opposition's core. It is a fine balance between trying to push forward and lurking towards your towers for cover before leading your minions forward. As the match progresses you are also constantly upgrading your hero with new powers and abilities that can alter your performance. The winning team is the one that destroys the other team's core and a full break down with an MVP award is given. I can honestly say that I have never played a MOBA. I have wanted to play MOBAs and even thought about getting into them, but I was always more of a Real Time Strategy gamer so I didn't see the point. At first Area of Valor didn't spark my interest, but then after reading up on the mobile game and Michael's excitement got me all in and I submitted for the closed beta. Lucky enough I was selected and I am really glad I was as I have really enjoyed playing the game over the last week with and without Michael. Unlike Fortnite that just throws you into battles, AoV guides you through a lovely tutorial of how to play the game, how to win the game, and how everything controls. Since I have played MMOs before, the idea of area effects and buffs wasn't any surprise to me nor were the different classes. What was unique was the strategy of trying to take down the enemies' towers all while trying to stay alive and power up. 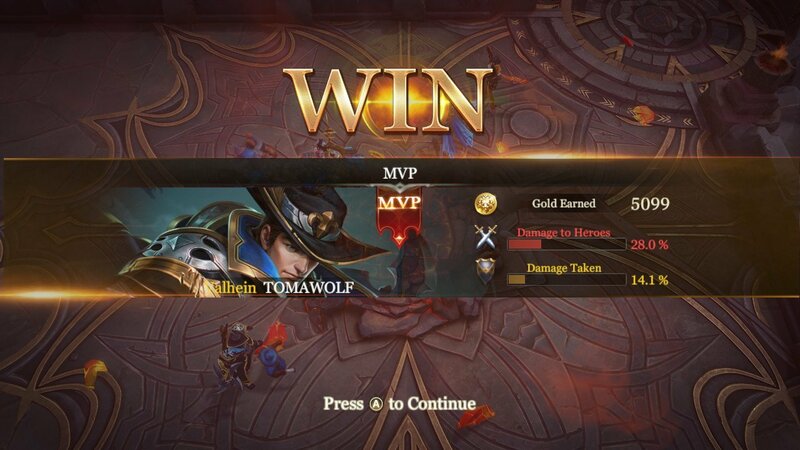 Every bit of AoV felt really good and polished on the Nintendo Switch including the control system. 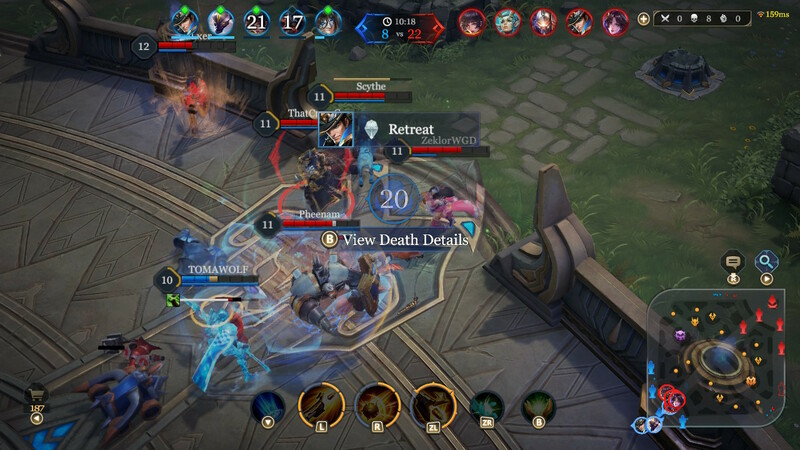 AoV doesn't feel like a mobile game shoved onto the Nintendo Switch as the controls have been finely tuned to easily allow you to navigate the arena, target enemies, and upgrade your hero as you progress through the game. The game also looks really great and performs really well on the Switch. It isn't the most mind blowing graphics in the world, but the textures, models, and environments look pretty solid especially in handheld mode. I very rarely felt like the game was lagging during gameplay and the only negative here was some slow down at the start or end of the game when things were loading or stats were being calculated. This seems like something they should be able to fix up before release, but even as is the core gameplay was always rock solid for me. Since all of the heroes were available during the closed beta I was able to try out a bunch of them and quicky realized that I am only really good at the marksmen and sometimes the mage. Each hero and class has their own abilities, skill trees, and power ups that are very unique and it seems like there is something for everyone. Now getting into each of the games seemed to be more of a mix bag. After selecting how many players you are thrown back to the home screen and sometimes have to wait, and sometimes not. You never really know why you are waiting or how long it will actually take as on average it would say 1 minute, but on a few rare occassions I had to wait for up to 6 minutes. Who knows if this is just because it is a closed beta, but once it goes live I have to assume there will always be someone to play. All in all I really enjoyed AoV and will be downloading it as soon as it becomes available. A few things on my wish list is to fix up the lobby and to put some sort of voice chat system for friends (which is built into the game already). If Tencent can figure these things out and fix a few slow downs I think they will have a a real winner on their hands. Like Motz, I too have never played a MOBA. When I saw that Arena of Valor was coming to the Switch at some point in the near future, I signed up for the closed beta. I was excited. Not only is it a genre currently missing from the platform, but its also my chance to finally try out a MOBA! Sure, I can play a MOBA on a bunch of other platforms right this minute, but let's be honest here, don't we all just prefer our games on the Switch?! When I first started the game I was greeted with a tutorial that helps explain the controls of the game. While it was fairly straightforward, it didn't seem detailed enough for me. I didn't really feel like I had a grasp of the intricacies of the game such as the item tiers, Arcana, or even the terminology (what the hell is "jungling"??). It was all a bit overwhelming at first but despite that, I decided to just jump right in. I was pleasantly surprised with how well the game controlled and played! The graphics look nice for both handheld and docked versions and played well with no stutters or lag. I did experience a few long wait times during matchmaking. Also, once players are in a match, there's a long load screen that happens before each match. I assume its loading all assets for each player's selected hero? I also noticed that some of the voice acting is still in place from the mobile version rather than rerecorded for Switch. For example, at one point the onscreen directions say to hit the A button but the voice is saying to "drag it to the X". These are minor issues and in no way deal breakers but still, it's something I'd like to see fixed for the official release. 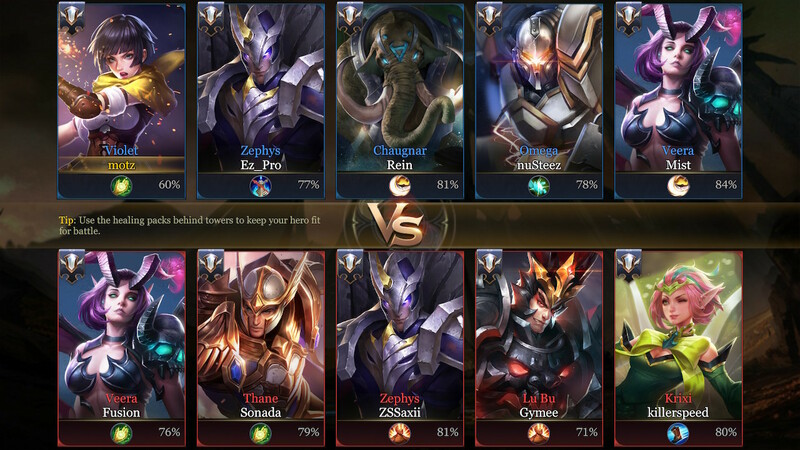 One of the best things about AoV is that each round is somewhere between 15 to 30 minutes (that's rare but it did happen) so there's not a huge time commitment. The beta was short and I was genuinely sad when it ended. I wanted more time! I felt like AoV has a lot of potential strategy and depth for the players that want it while still being simple enough for casual players. I'm really looking forward to this coming out!